ALLENTOWN, Pa. -- The 1-year-old baby boy, who police say was thrown into an Allentown river last weekend at the hands of his own mother, has died. Baby Zymeir Perry died Saturday at Lehigh Valley Hospital-Cedar Crest. An autopsy is scheduled for Monday to determine the official cause of death. The incident happened around 1:40 p.m. Sunday, May 3rd at the Hamilton Street Bridge. Police say this appears to have been an attempted murder-suicide. 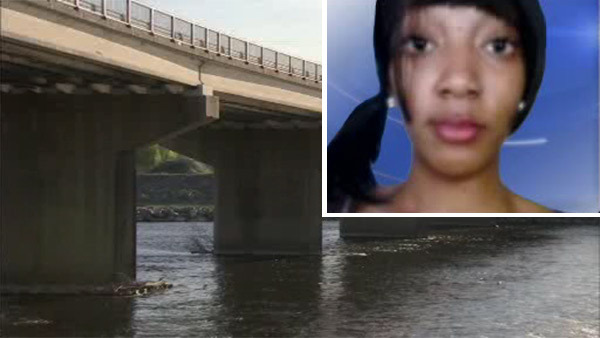 The child's mother is identified as 19-year-old Johnesha Perry. Witnesses told police that they saw Perry push a stroller with her 1-year-old onto the bridge. That's when witnesses say she kissed her baby boy and then pushed him over the railing. The child then fell more than 50 feet into the Lehigh River. Johnny Liciaga drove up to the scene moments after. "I saw a stroller half way down the sidewalk and when I got over here, they were telling me a lady threw her baby over the bridge, then she jumped off," said Liciaga. The mother made it out of the water onto the embankment, then collapsed. Her baby was 700 yards downstream and was in the water for four minutes. Officer Joseph Ianetta pulled him from the water then began CPR with fellow Officer John Leonard. The officers were able to revive the infant. Both the baby and the mother were taken to Lehigh Valley Cedar Crest Hospital. The child clung to life for days but died Saturday morning. Neighbors say Perry and her boyfriend had been getting into heated arguments as of late, and she seemed dejected on the morning of the incident. Gloria Rivera, a neighbor of Perry's, tells us, "She was sad that day. She get out like crazy, and she was walking and she was sad. But nobody talk to her that day." Ironically, Perry was seen having a good time with friends during a cook out the day before. Willie Lopez was among those who saw her there, with the baby. Lopez says, "Just Saturday there was a picnic, little boy was just playing with that little wheel right there. He was just playing with it, like last week he was sitting there playing with it in my yard. And it's just tragic." Initially Perry faced charges of attempted murder, aggravated assault and endangering the welfare of a child but upon the death of her son, those charges are expected to be upgraded.